Saturday 24th December – 6pm Choir sang Carols for the guests at Castle Inn, Bassenthwaite, Keswick. Saturday 17th December – 11am – Choir sang Carols in Sainsbury’s Supermarket, Station Street, Cockermouth. Friday 16th December – Choir sang at St. Philip’s Church, Eaglesfield. Saturday 10th December – Our Christmas Concert at Christ Church, Cockermouth was a tremendous success. A full house listened to the premier performance of Dr. Philip Wood’s ‘A Trinity of Carols’, especially written for the choir to celebrate their 40th Anniversary. Mr Richard Bennett the choirs’ founder conducted his favourite John Rutter Christmas Carol – ‘The Star Carol’ and our current Choir Director Val Hetherington ably conducted the choir through a wide selection of Christmas pieces and congregational carols with Anne-Marie Kerr accompanying. Well done everyone. Our guests for this concert were the Papcastle Wind Quintet. Friday 2nd December – Choir sang for St. Cuthbert’s Church, Embleton Carol Supper at Embleton Village Hall. Saturday 26th November – 10 am Choir sang at Dearham Christmas Market held in Dearham Primary School. Lots of lovely Christmas crafts for sale. 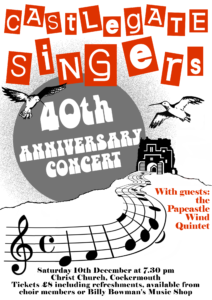 Saturday 15th October – 7 for 7.30pm 40th Anniversary Dinner and Entertainment – Hundith Hill Hotel. See 40th Anniversary page for more details.